This article will delve into an oft-neglected area in tactics theory: the half-spaces. In our analyses we have often made reference to them. We are also frequently asked what the half-spaces are and what their purpose is and I want to devote myself to answering that question here. First we should categorize the half-spaces and then briefly discuss their characteristics. The playing field is typically divided into several parts. There are many different approaches to this division. One method is to divide the field into the predetermined lines of the formation. There are usually either three or four horizontal lines or bands. In a 4-4-2 there are three bands and in a 4-1-4-1 there are four. Between the bands there is the “intermediate line space” or, the space between the lines. The same process can be applied to the field vertically. It’s also possible to make simple divisions of the field. Most of these systems divide the width of the field into three parts; the two wings and the center. Louis van Gaal differs by cutting the field into 18 rectangles, 6 vertical by 3 horizontal, in which players have certain tasks and responsibilities. The middle column here is a little wider and is still mainly divided into the middle and the wings. Depending on which part of the field the players are in and which of the four phases of the game the team is in (in possession, out of possession, defensive/offensive transition), certain players will have different tasks based on the four reference points of Arrigo Sacchi. Another alternative is to divide the field into pure geometric splits, e.g. 18 zones (3×6) of equal proportion to one another. The “intermediate line space” of a team that sits deep will pop up in the ominous “Zone 14”, which is considered by many to be a crucial element of the game. Personally, I am in favor of a division that is more focused on the tactical events, key strategic areas, and their respective game situations. Therefore I divide the field into three basic areas: the wings, half-spaces, and center. Alternative scheming in the horizontal; “outside/wing” – “halfspace” – “middle/centre” – “halfspace” – “outside/wing”. For English readers it should also be important that obviously “halfspace” is not a good word, but it’s not an invention but the translation of the word “Halbraum” which is established in Germany already for years by it’s elite coaches and the German FA. Theoretically, you can make the wings (Außen) in the picture above even smaller, extend the half-spaces (Halbraum) and the middle (Zentrum), or divide the three zones differently by area; even a division into seven columns is possible. But, the center of course always refers to the middle. The center is – as in chess – usually seen as the main zone. Whoever controls the center, controls the game. One can easily explain why with a few examples. The freedom of choice is greater in the middle of the field. There is no boundary created by the touchline. One has roughly eight basic directions from which the ball can be played (forward, backward, left, right, and four diagonal lines). On the wing there are only five directions (forward, backwards, square to the left or right, and two diagonal lines). This means that the space to work with is limited and the precision of vertical passes must be higher. This is not the case in the middle. A team that bases their play around establishing a greater presence in the center will have many more choices and thus be more dynamic. The opponent must also not only defend the two wings, but the middle and both wings, because from the center of the field either are directly playable. On the other hand, the center is usually heavily occupied, so there is generally less time to make decisions. In addition, more space must be surveyed (360°) by the passer. Therefore, teammates and opponents can easily be overlooked. The lack of time on the ball, coupled with the challenge of lacking space, does not generally occur on the wings, where the opponent’s shape is usually less compact than in the middle. Furthermore, the winger need only survey 180° to see the whole field. Also, turnovers in the wide zones are less problematic than in the center. 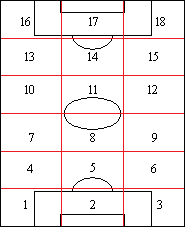 As was mentioned in the example of zone 14, the path from the center to the goal is the shortest. Losing the ball on defense there causes an immediate threat to one’s own goal. But why should there be an additional division of the wing-center-wing into the half-spaces? The answer is simply a logical association with the game of football. Football is about scoring goals. Whether you’re a romantic or pragmatist, fan or coach, tactician, strategist or slob: everyone ultimately wants the ball to go into the net. 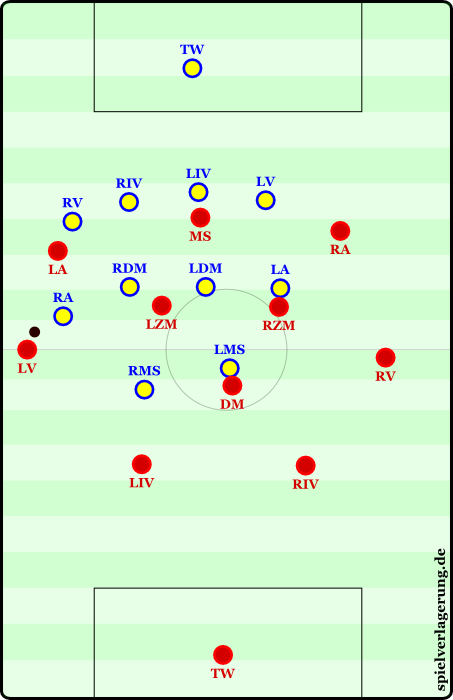 The goal is located in the center of the field; both teams’ shapes change for the purpose of ball-oriented defending, reducing space, and zonal marking, depending on the position of the ball. If the ball is on the wing, then both teams will look different than when the ball is in a central position. The “half-space” exists in this sense for analysis. 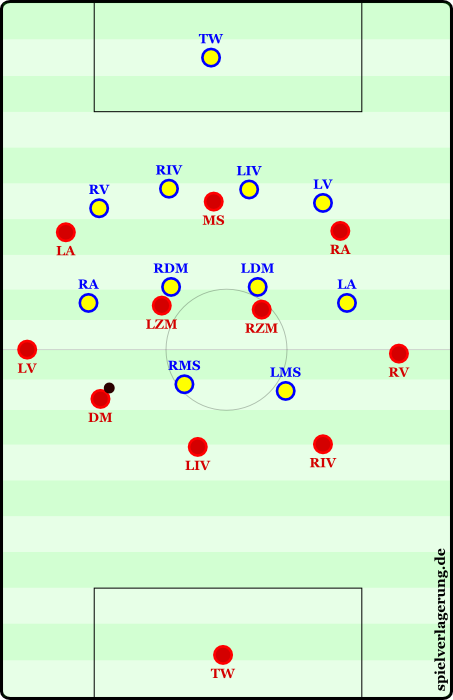 Looking at the shifting movements of two teams, one not only notices the differences between the ball being on the wing or in the center, but also in a position in between the two; the half-space. For the sake of explanation, imagine a team in a 4-4-2 is defending against a 2-5-3 team in their buildup phase. 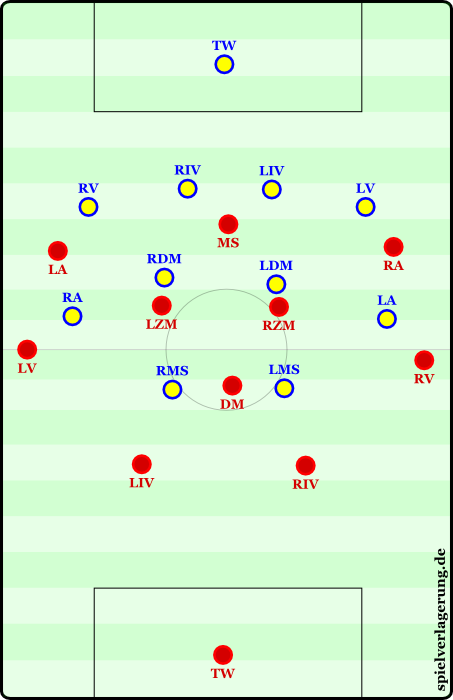 The six of the offensive team drops slightly and faces up vertically and centrally between the central defenders. The 4-4-2 team is in their “normal” positions. They must not move and this is the basic shape of the offense and defense. Both teams will now play towards a goal; that of the defending team. One team on offense, one on defense. In the next scene, the ball has landed on the wing. The defending 4-4-2 team shifts the near winger over to establish access and their shape changes. The full-back moves up to cover and the two central defenders are deeper, similar to the crescent shape we see in the midfield. The movement, the circumstances, and the strategic options are different. Naturally, the team plays from here towards the goal, but the spaces are now much tighter and difficult to break down. In the last scene, we’ll look at what happens when the ball is in the half-space. For this purpose, the six (or a set disengaged central defender) stands in the half-space. Again, both teams change shape. We can therefore assume that the half-spaces are ideally classified as a separate space, because the resulting movement of both teams creates strategic differences. As we move between these three zones, the position of the ball only changes slightly. The movements are intense, but there is no fundamentally new shape. Thus, it should be ruled out that a further vertical dimension is needed in the layout; only the passing options and taktikpsychologischen aspects (earlier shots around the penalty area, etc.) are different. 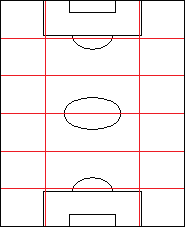 Adding the half-spaces between the center and wings results in a different view of the strategic and tactical peculiarities of the game: the fields of view are one aspect. In a central position, with both teams standing right in front of the goal, the fields of view are both vertical. For positions in the half-spaces, however, the fields of view are not vertical, but diagonal. A player in the half-space has as many options as the central player, but doesn’t have to turn away from the center and play to the side, instead maintaining a diagonal, goal-facing view of the field in his passing game. The field of view or visual field is composed of the foveal and peripheral vision. In contrast to the foveal vision, in which the eye’s sight line is aligned exactly with a targeted object to take advantage of the maximum central vision, peripheral vision provides rough, blurred, and distorted visual impressions outside of a solid fixation point. In principle, the object in question is “seen by” the peripheral vision. The sight field has a horizontal binocular (binocular) expansion of about 180-200 °; and vertically about 130 °.